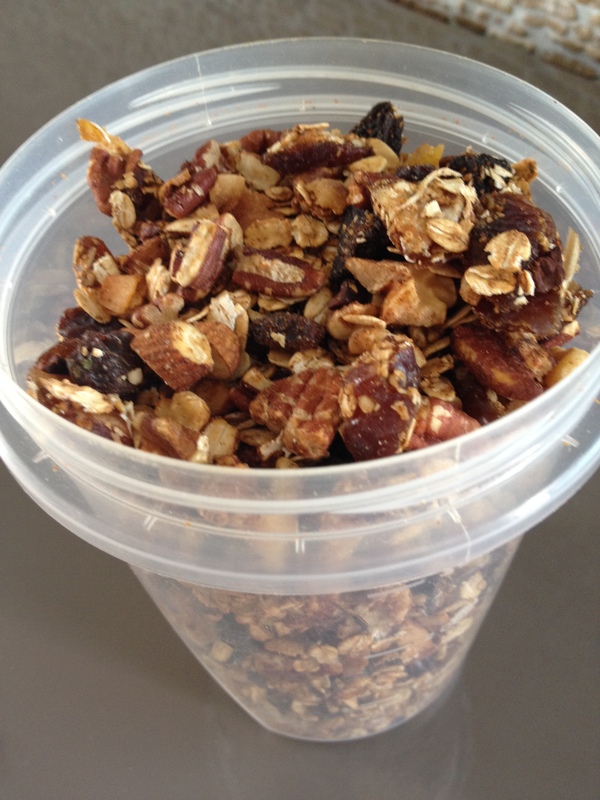 This granola is great served with yogurt, in acai bowls, or simply added to your cooked oatmeal. It can also be eaten as a snack. In less than 1 hour, you can have it ready for breakfast! To a large bowl, add oats, almonds, pecans, walnuts, hemp seeds, coconut chips, cocoa nibs and toss. Add ground ginger, ground allspice, cinnamon and mix well. Add honey and using hands incorporate honey into mixture to make sure mixture feels crumbly. Add a little more honey if you like it sweeter. Place on cookie sheet and bake at 350 degrees F for 30 to 40 minutes. Take out of oven and let cool for 15 to 20 minutes. Meanwhile, chop figs, apricots, and dates. Add raisins and then add fruit mixture to oat mixture.